Twitter's new collections feature, pictured June 19, 2015, lets curators create listings of retail items and places. Twitter has long positioned its site as a way to see what's happening in the world. Now, it wants to tap into our desires as consumers. 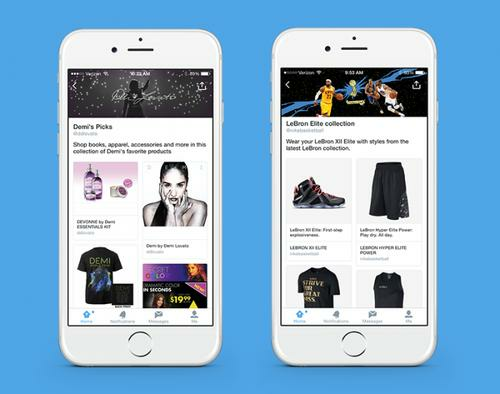 The company is testing a new way to highlight products and places on its site, bringing relevant tweets to the fore while also providing a way to purchase items. It's a considerable expansion beyond the company's previous forays into e-commerce. In an example, it showed a page it built for the book "The Martian," complete with related images, tweets, and a button that says Buy on Twitter. The new pages will be promoted through people's Twitter feeds. As well as Twitter building these pages, celebrities and brands will be able to build them too. It offered examples of pages built by Demi Lovato, Reese Witherspoon, Nike and Target, the last of which is filled with tweets promoting summer clothing, for example. In earlier tests, tweets from brands might include a buy button, but they appeared in the regular Twitter stream and not pulled out on separate pages. It's the latest move by Twitter's part to attract more users. They also show a stronger play by Twitter to compete against rivals like Facebook and Pinterest, which have also started to let users buy products. Twitter said it had more than 40 partner curators, who also include musician Amanda Palmer and YouTube personality Michelle Phan. The features arrive amidst other new efforts by Twitter to expand its service and grow its users. On Thursday, Twitter's Project Lightning was revealed -- an upcoming feature to better surface content around live events.